No kids: Albany’s Central School at mid-morning on Thursday. School officials in the mid-valley came in for some grumbling when they canceled classes day after day following the snow storm on Dec. 6. But put yourself in their shoes. Thursday was the fifth weekday in a row of no school in Albany. While it had been bitterly cold, it had not snowed since the preceding Friday, and the main roads were clear with icy spots sanded. Commerce and the rest of life was proceeding more of less normally. So why no school? 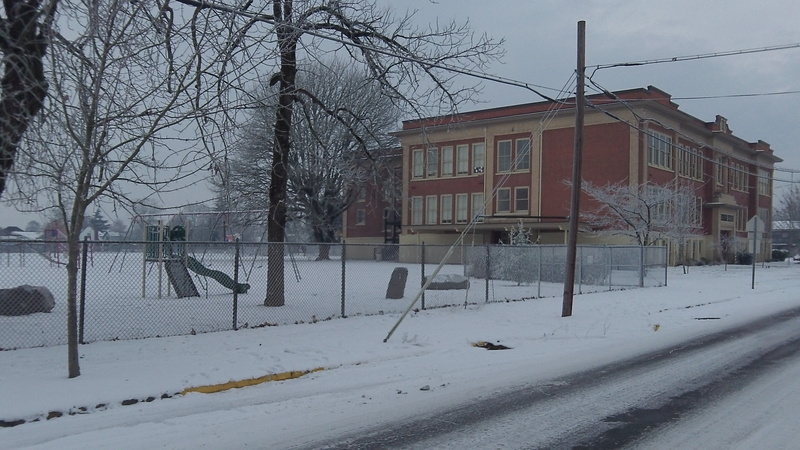 There was no school because the forecast was for freezing rain from mid-day through the early evening. The National Weather Service, in a special statement from Portland for the southern Willamette Valley, warned people to stay off the roads. So did ODOT. Benton County closed its offices by 1 p.m. to give employees a chance to get home. No one can safely drive on fresh ice, chains or not. Sanding does not help unless the ice storm is over. Had the schools opened, they would have faced the prospect of stranding — in Albany’s case — 9,000 children and teenagers in the district’s buildings with no way to get them home.